When Effie's son Lewis A. Smith died 25 years ago, E. A. Smith's personal effects, photographs, papers, and paintings were passed on to two nieces, and more recently to others in the family. During my school days in the 1950's and 60's, Lewis (1898-1986) and his wife Claire came from far away Arizona for sporadic visits to our family home in Upstate New York. And we visited Lewis and Claire twice during the 60's to see for ourselves the beauty Effie depicted in her desert paintings and Grand Canyon works. But it was the extended conversations I had with Lewis when I lived in Arizona during the 1980's which caused me to fully appreciate Lewis and his recollections of pioneer life in Arizona. Its history, geology, the raw natural beauty of its deserts and mountains, and how these elements combined to inspire his mother, Effie Anderson Smith, in her paintings. Lewis's knowledge of geology came from his own career in mining, and the mentoring of his father, pioneer mine engineer and businessman Andrew Young Smith. Equally important to Lewis was the artistic legacy of his mother, and Effie's love of the desert vistas around Cochise County, the Grand Canyon, and other favorite locales. Effie herself was a keen student of geology, and lectured on how the mineral content of Arizona's mountains and particles in the air gave the region its unique colors and light. Lewis would recount his observations from the frequent plein air painting outings during his childhood, playing nearby yet aware of his mother as she studied and sketched the landscape, mixed her paints, and then created another of the works for which she became so well known. Despite the boom and bust of life in a mining camp, the obligations that went along with being the wife of a mining executive, and raising a family, Effie found time to express herself through painting, writing, and speaking - and to further her talents through studies with noted Impressionists in California. It is from these accounts directly handed down with the paintings and artifacts, plus the research I pursue to connect items in the Archive with public records and published notices from the period, that the E. A. Smith Archive derives its content and context. The E.A. Smith Archive is a virtual one; that is, it is not currently housed in a public physical location. And as my research continues, it is a work in progress. By necessity, an avocation. But as defacto 'curator' I am happy to hear from researchers, appraisers, collectors, educators, or anyone interested in Effie Anderson Smith. Study copies of selected items from the Archive are available, including resources not currently online, along with our well considered insights into the E. A. Smith paintings you may possess or are researching. In turn, the information you share about any E.A. Smith painting will be very helpful as we continue work on our forthcoming Catalogue raisonné . The E. A. Smith Archive is interested in working with individuals and institutions to increase awareness of Effie Anderson Smith (Mrs. A. Y.) as "the Dean of Arizona Women Artists", especially as Arizonans observe the centenary of Statehood in 2012, and as the 150th anniversary of Effie Anderson's birth approaches in 2019. Your comments, questions, and inquiries are invited. My passion for the arts began early. While others in the family had artistic gifts for drawing and painting, I initially gravitated toward music. In the 1970's I became a classical music radio announcer and later served as senior manager for two classical radio networks. In the online world, I founded the Fine Arts News Service, and more recently served as Director of Music and Media for InstantEncore. Originally from Upstate New York, my media and arts work took me to jobs in several great cities of the upper Midwest, the Southeast, and the Mountain West. Since 1985 the Southwest has been my primary home. I've lived in beautiful San Diego since 2005. Effie believed the arts are an essential and integral part of the human experience. I feel privileged to play a role in preserving Effie's legacy, and keeping it alive. Thank you to Brian Ballard of Old Pearce Preservation Association, and Douglas historian Cindy Hayostek, for their encouragement, help and many insightful contributions. Their knowledge and understanding of the communities where Effie Anderson Smith spent the majority of her life make my research much easier and tangible. And their perspectives on the history of Pearce, Douglas, and Cochise County keep these places as interesting to read about and visit, as ever. Thanks also to Phyllis Rogers Martin and Wilda Marshall Brown, Effie's great-grand nieces, whose insights into Effie's family history and early days in Arkansas, New Mexico, and Arizona have filled in many gaps and illuminated the near and distant past. Phyllis has especially been generous with her time and knowledge, confirming faces in photos, providing historic documentation, and sharing the fruits of her many productive years of genealogical research on the Andersons back to colonial days and beyond. Special thanks to Scott Barnebey for offering his expertise and aesthetic sensibilities in creating the prominent graphical elements of this site. And to Susan Ballard for her willingness to edit my ramblings, and assist with getting the word out about the E.A. Smith painting exhibits. Welcome to the E. A. Smith Archive. This website features memorabilia from a collection of the artists' papers which remain in family hands. Newly digitized images of her paintings, photographs, documents and other emphemera are posted as they become available. We are gathering details on paintings by Effie Anderson Smith to be included in our forthcoming catalogue raisonné , so we're always interested to hear about any E. A. Smith (Mrs. A. Y.) paintings, photos, letters or other related items you own or have seen. Your comments and questions are invited. TUCSON DESERT ART MUSEUM is presenting EFFIE! Plein Air Pioneer - a 150th birthday retrospective exhibit, on display NOW through April 28th, 2019. The Museum is at 7000 E. Tanque Verde Road in Tucson. Details at the TDAM website. CALL FOR PAINTINGS !! We are seeking E.A. Smith paintings for several exhibits to take place in Arizona, California, New Mexico, and Arkansas in 2019 in observance of Effie's 150th birthday anniversary. If you have an E.A. Smith painting you would consider loaning for display in our exhibits, please use the CONTACT link above. ANN JAPENGA continues her wonderful series CALIFORNIA DESERT ART with a very encouraging article about Effie's art, and our efforts to restore greater understanding and appreciation of Effie's artistic legacy. ENCYCLOPEDIA OF ARKANSAS History and Culture now includes an updated biographical sketch on Effie, including recently uncovered facts about her youth, in and around the towns of Nashville, Washington and Hope, in Southwest Arkansas. 1869: Born near Nashville, Arkansas. 1884: At 15 Effie is painting landscapes. 1890: Weds W.M. Spencer in Hope, Ark. 1891: Effie becomes a widow at age 21. 1894-95: Teaches school in Deming, NM. 1895-96: Weds A.Y. Smith, settles in Pearce. 1904-28: Travels to CA for art studies. 1907: Art becomes solace after death of baby girl. 1914-16: Studies in Pasadena & Laguna Beach. 1927-30: Notoriety of Grand Canyon works. 1929: Fire at Smith home, some works lost. 1931: Exhibits in major Eastern Cities. 1931: Beloved husband A.Y. Smith dies. 1932-45: Effie's most prolific years as artist. 1942: Effie unveils new series on Desert Flora. 1945: Starts art discussion class in Douglas. 1948: Effie begins painting Coronado Trail series. 1951: Moves to AZ Pioneers' Home in Prescott. 1953: Effie ceases painting due to vision issues. 1955: Death claims Effie - Age 85. An Exhibition Catalogue is now available from our 2012 Arizona Statehood Centennial exhibit in E-Book (PDF) format. We are happy to provide a copy to interested collectors, art historians, dealers and appraisers. The contents of this website are made available for educational and research purposes, and for the private personal non-commercial enjoyment of individuals wishing to learn more about the life and art of Effie Anderson Smith. Please do not copy, distribute, or publish these materials in any manner. Questions or comments? Please contact us. Copyright 2011-2018. 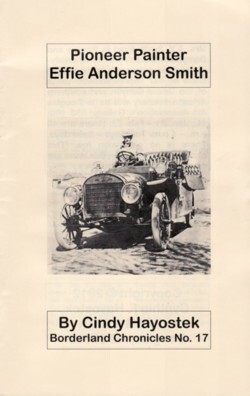 EASmith Archive.